I'm jetting off on holiday as of tomorrow. I have no idea if I will be able to update the blog while I'm away or not, it all depends on if I can find access to t'Internet easily or not. If I don't get access, expect a fair few 'travelogue' posts when I get back. I must admit, I haven't tried this one yet. I keep seeing references to it and loads of people rave about it but so far I've been to much of a chicken. 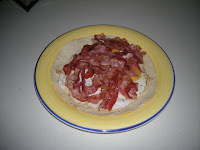 I've borrowed the recipe and picture from Saveur magazine, one of the best food magazines out there. Dip rims of two tall chilled glasses in a saucer of water, shake off excess, then dip moistened rims in a saucer of salt. Fill each glass halfway with ice, then one-third full with lime juice, and top off each with beer. Add 1–2 dashes worcestershire and Tabasco to each. Garnish with lime wedges, if you like. This is a really nice and simple recipe for a starter. You can vary the filling as much as your imagination will let you. I must admit that I sometimes make a bunch of these to snack on, that's how much I like them. I haven't made any in a little while so I don't have any phots, so I've taken the liberty to borrow both photo and this particular recipe from devilledeggs.com. Naughty Mike. 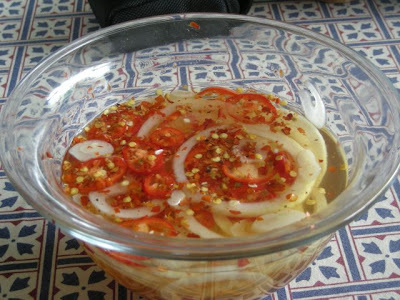 ;) You can find step by step instructions on this site as well, which can be of help the first time you try to make these spicy little numbers. 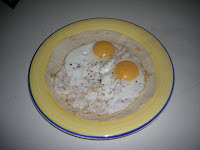 Pop out (remove) the egg yolks to a small bowl and mash with a fork. Add mayonnaise, mustard, 1 tsp of the chives, hot sauce, salt and pepper and mix thoroughly. 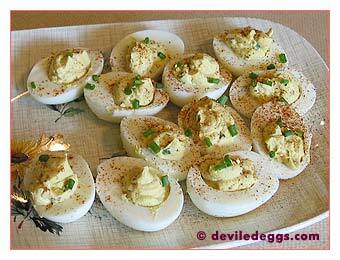 Fill the empty egg white shells with the mixture and sprinkle lightly with chives then the paprika. 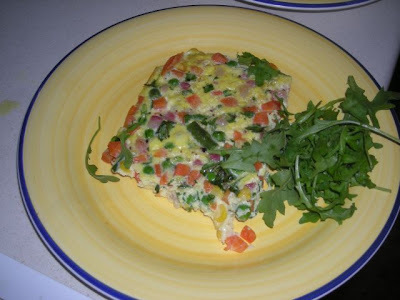 Cover lightly with plastic wrap and refridgerate for up to one day before serving. 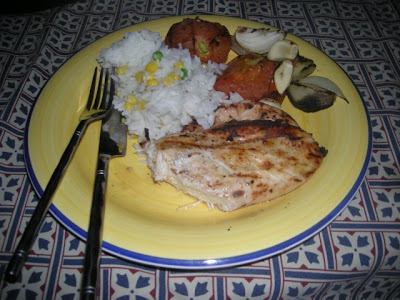 Chicken breasts that are barbecued can quite easily turn dry and boring. Brining them is a way of avoiding this. It's not just chicken that can be treated this way. 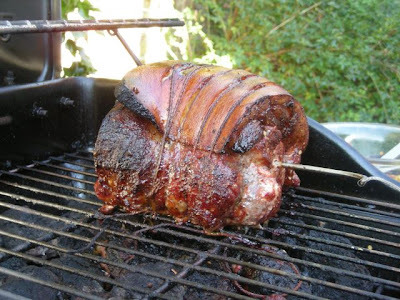 Turkey, pork and even fish steaks can benefit from being brined. If you try this recipe you'll definitively notice a difference in how moist the chicken is. Just don't overdo it, two hours is well enough. Put the chicken breasts in a non reactive dish. Place the salt, brown sugar, peppercorns, chile pepper and bay leaves in a large non-reactive bowl and add the hot water. Whisk until the salt and sugar dissolves. Pour in the cold water and let cool to room temperature. 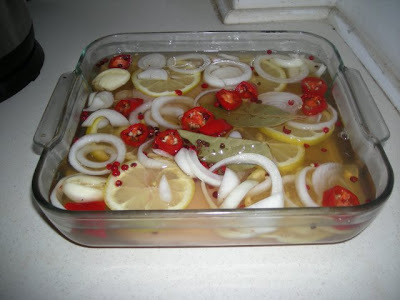 Pour the brine over the breasts and stir in the lemon slices, onion and garlic. 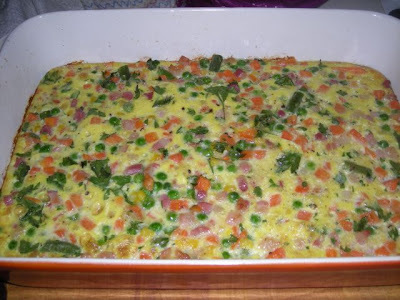 Cover the dish with cling film and put it in the refrigerator for 2 hours. Turn the breasts over once or twice. 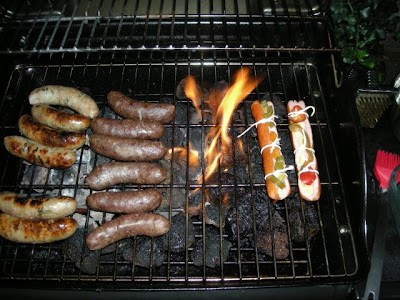 Set up your barbecue for direct grilling and preheat to high. Brush and oil the grill gate once the barbecue is hot enough. Put the chicken breasts on the barbecue and grill until done, 4 to 6 minutes per side. To test for doneness, poke a breast in the thickest part of the breast. It should feel firm to the touch. The chicken breast are in the brine. 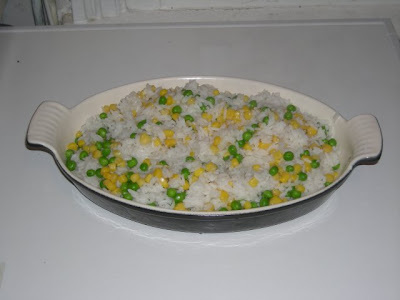 Some rice with sweetcorn and peas makes a nice side. Here we are, you can almost see how juicy and tender the chicken is. Set your oven to 225c/425f/gas mark 7. Fry the cubed bacon in its own fat. Add the vegetables and the parsley. Whisk together the eggs, water, salt and pepper. 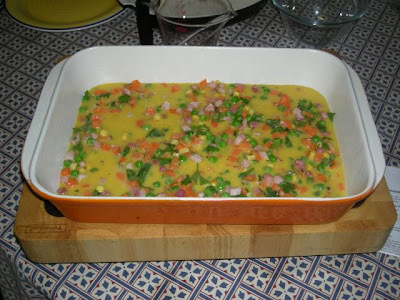 Pour the fried bacon and vegetables into a oven safe roasting tin or similar. Pour on the egg mixture. Put the roasting tin in the middle of the oven, let it stay there for about 20 minutes or until the omelet is set. 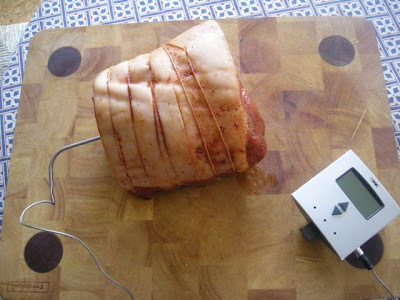 This is a recipe where you can't rush things, let the pork slowly get up to the right temperature. If you rush it you'll not get the right result. 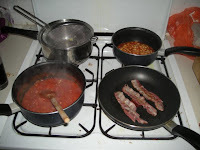 There are some pictures of the progress below the recipe. Sprinkle the pork on all sides with the rub and then work it into the meat using your hands. 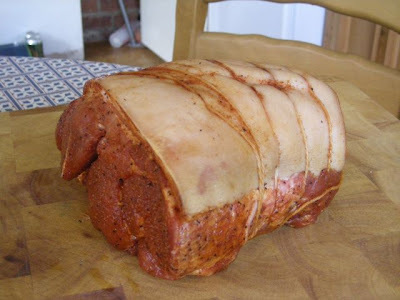 Ideally you should now let the pork rest in the fridge, covered, for up to 24 hours. The longer you let it sit the more flavour it will get. 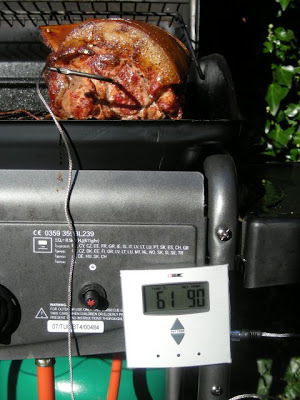 Set up your barbecue for indirect grilling. Add your wood chips or pellets to the barbecue preheat to high until you see smoke, then reduce the heat to medium-low. 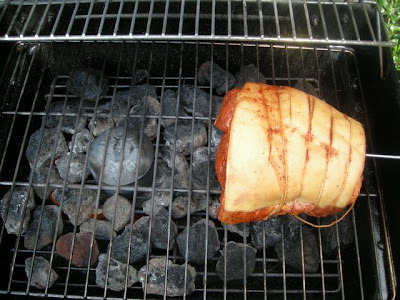 Place the pork, fat-side up, on the cool side of the barbecue. 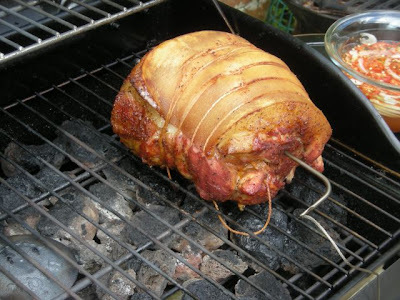 Cover the barbecue and cook the pork until very tender, 4 - 6 hours (about 90C/195F on a meat thermometer) After 1 hour, baste the pork with the mop sauce; repeat every hour. 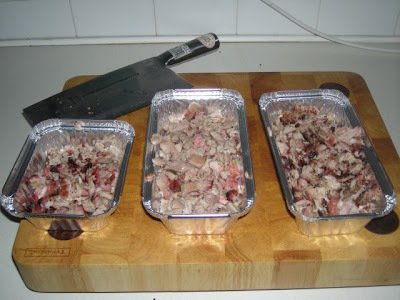 Transfer the pork to a cutting board, cover loosely with aluminium foil and let rest for 15 minutes. When ready to serve pull off the skin and fat. 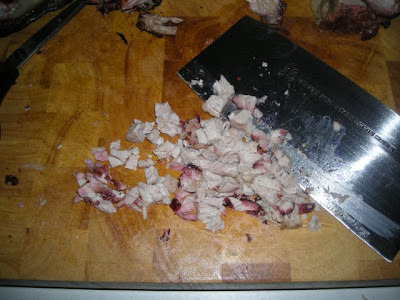 Finely chop the crisp skin with a cleaver, to add to the pulled pork or discard. Discard the fat. 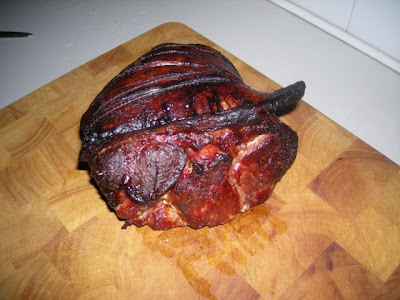 Pull the pork into pieces or use a cleaver to chop it. Transfer the shredded pork to a roasting pan, or similar, and stir in 1 - 1 1/2 cups of the vinegar sauce, enough to keep the pork moist. Cover with aluminium foil and keep warm. 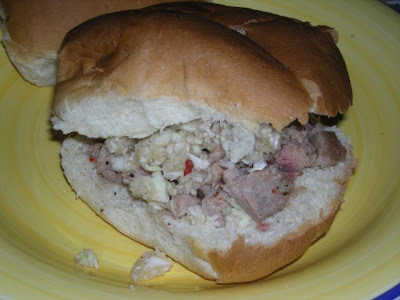 To serve, put the pork on hamburger buns and top with coleslaw. 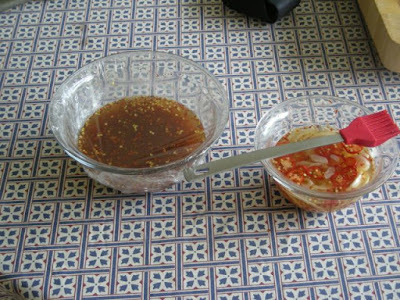 Serve any remaining vinegar sauce on the side. Combine all the ingredients in a non-reactive bowl, and stir until the salt and brown sugar dissolves. Combine all the ingredients in a non-reactive mixing bowl and whisk until the salt and brown sugar dissolve. Taste for seasoning, adding hot pepper flakes if needed. Transfer the sauce to clean jars and store in the refridgerator. It will keep for several months. Core the cabbage and remove the outside leaves. 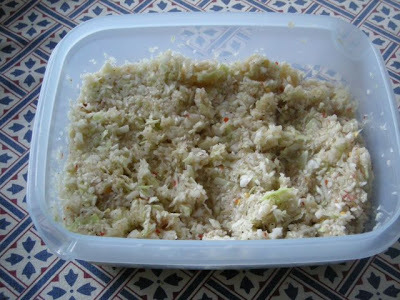 Cut the cabbage into chunks and finely chop it in a food processor. Transfer the cabbage to a nonreactive mixing bowl and toss with the vinegar sauce. 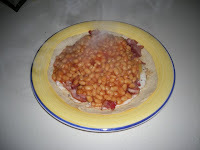 Taste for seasoning, adding vinegar sauce as necessary. If you are in the mood to try something different I can highly recommend a visit to the Osarika African Caribbean Restaurant & Cafe here in Reading. The staff there are very friendly and you can tell that they care about you as well as the food they serve. They are as far removed you can be from the normal surly and dis-interested staff that you find in any of the chain restaurants around the Oracle for example. I have (so far) very little knowledge about what is what when it comes to African and/or Caribbean cuisine but I've been made to feel welcome here and the advice I've been given have been spot on. The food you are being served is freshly made and tastes awesome. 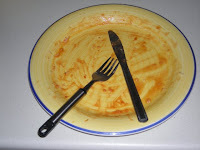 You can tell that lots of love and care goes into each dish that they make. All ingredients are fresh. 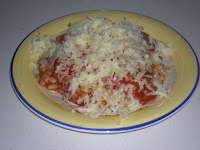 For example, each part of salads that are served on your plate is nice and crisp, no three day old cucumber slices here. The portions are very generous without being too big. 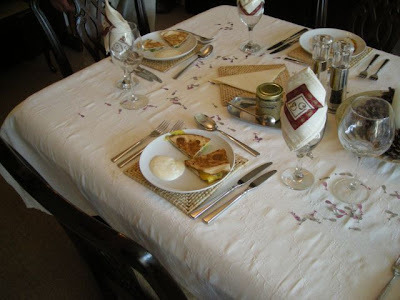 You leave the restaurant pleasantly full, already planning what you will eat next time you go. One tip: Try the goat curry! They are open for lunch as well as dinner. During lunch you can choose between eating in or taking away your meal. You can rent the entire restaurant for a bigger meal or after what I can understand there's also the offering of off-site catering if you would like that. The restaurant is located on 91 - 93 Kings Road (click for Google map) here in Reading. They do have a website, but last time I tried to reach it there was a problem. For more info and/or reservations call them on: 0118-956 9970. Mikey's advice: Go there now, and bring your friends! This is a recipe for a starter that I tried for the first time the other weekend. It comes from a TV show called The Surreal Gourmet. For being a first try I think it worked excellent. You can follow the preparations in the pictures that are posted below. I've already had some crazy fool :) try to cook this and replacing the brie with goats cheese, something that apparently worked fine. One small tip that might help you is to freeze the brie for 45 minutes to an hour before trying to cut it. 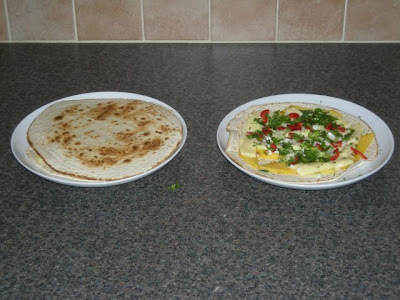 Prepare all the fillings for the quesadillas. I'd recommend that you remove the rind from the brie before starting. 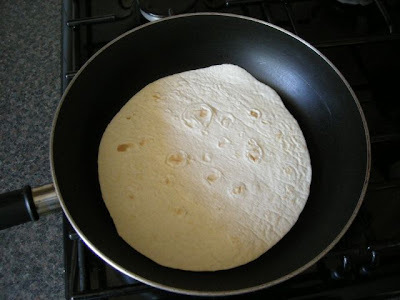 After the second tortilla has browned, leave it in the pan and reduce heat to medium-low. 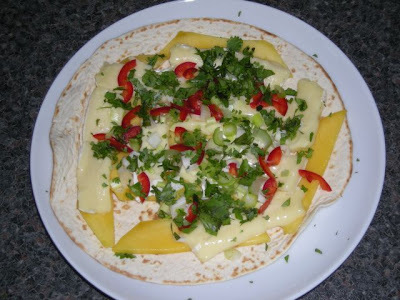 Spread half of the mango evenly over the tortilla, then top with half of the peppers, scallions, cilantro and Brie strips. 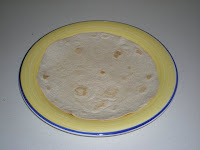 Top with the first tortilla. Cover the pan with a lid, reduce heat to medium-low, and cook for 2 minutes. Remove the quesadilla from the pan, let sit for 1 minute, then slice into 8 wedges (like a pizza). Serve immediately with the sour cream dipping sauce. Blend sour cream, lime juice and salt with a fork until the mixture is smooth. Transfer to a small decorative bowl or teacup and refrigerate. This recipe comes from the How To Grill book I reviewed yesterday. This is my first try (see the photos below) and they didn't look half as good as the ones from the book but they tasted great though. Try these for your next barbie and your guests will be well impressed. 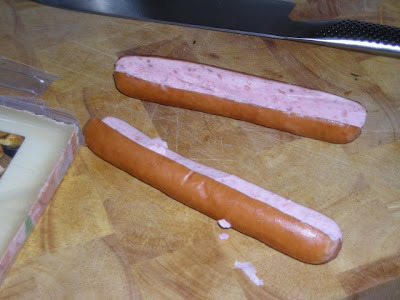 Make two lengthwise cuts in each hot dog to remove a slender v-shaped strip from the center. 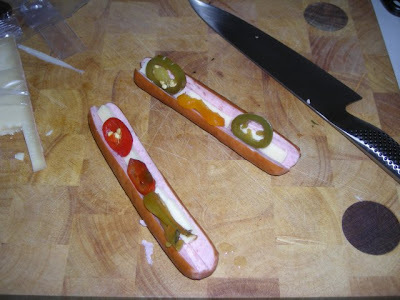 Insert the cheese and four jalapeno slices in the slit. 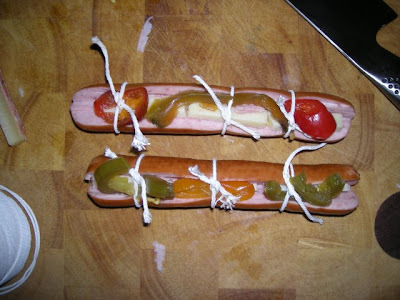 Tie each hot dog crosswise in two places (or more) with butcher's string. 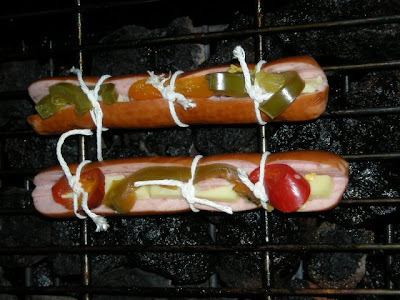 Place the hot dogs on the grill parallel to the bars of the grate, so the bars hold the hot dogs upright. 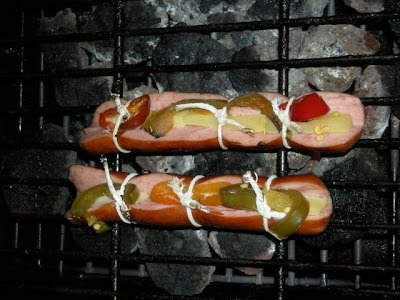 Grill the bottoms until crisp, then roll the hot dogs slightly to grill each side. 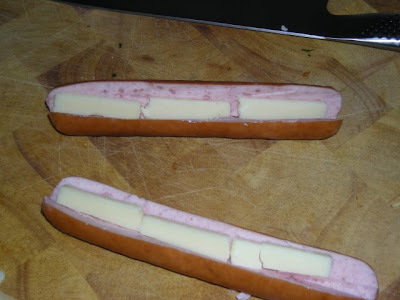 Brush the inside of the hot dog buns with the butter and heat them on the grill. 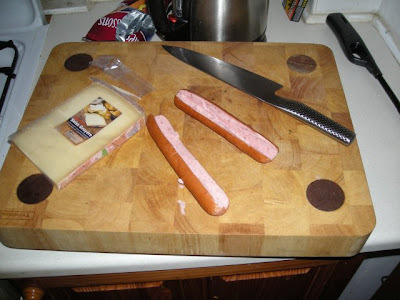 Assemble the hot dogs and the condiments in the buns. 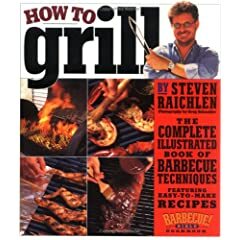 I recently bought How To Grill by Steven Raichlen. I can't give it more praise than telling you that if you ever consider barbecuing anything - buy it. I can open this book on any page and find a recipe that makes my mouth water and my body wanting to go outdoors and fire up the old barbecue. The recipes are divided in logical chapters. You got the pork, beef, fish, shellfish and so on chapters. All recipes comes with excellent instructions and mouth-watering step-by-step color photos. 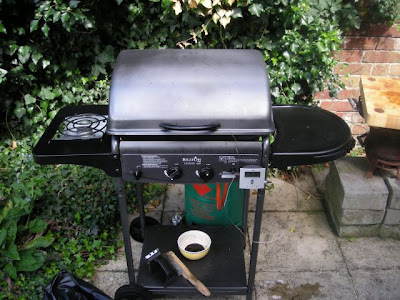 Besides the recipes there are also chapters on how to set up your barbecue, how to clean and look after it as well as advice on various types of barbecues and equipment. My biggest problem with this book is how to choose which recipe to cook first! Mikey's advice: Go and buy yourself a copy. You will not regret it!